When Jose Mourinho returned to Chelsea, there were reservations. Despite his unquestionable success as a Chelsea manager, his first spell at the club hadn’t ended well. He’d won everything but the Champions League with us, yet lost his head too often in the process. He’d also lost a fair bit of respect – not least of all from Roman Abramovich. Bridges had clearly been built during his absence and the foundations of those were deemed strong enough from within Chelsea Football Club to invite Mourinho back. Yet from day one, it’s been apparent we weren’t in for a remake of ‘The Special One Rides Again’. For a start he made it clear we wouldn’t win the Premier League in his returning season – and he was right. Unlike 2004/05 where he’d inherited a side more than capable of winning the title and indeed, only finishing 2nd to Arsenal’s invincibles the season before, this time around he was picking up a squad who’d finished 3rd the previous two seasons and a side with key players who’d been disrespected and demotivated under an interim manager. In other words, we were far from a side on the up this time round. No matter because whilst his competitors surveyed the market, having seen what was missing, Mourinho wasted no time in bringing in Cesc Fabregas and Diego Costa. With a nod to FFP, the sales of David Luiz, Romelu Lukaku and Andre Schurrle even saw us turning a transfer profit, and from day one of the season against Burnley, it’s been evident Mourinho intended to fulfil his title promise. The football played in the first half of this season was an absolute privilege to watch, naturally that’s been conveniently swept under the carpet by the critics as Jose Mourinho set about phase 2 of our title win. Whilst the march to December saw us create a 6 point gap at the top as the only remaining unbeaten side, City clawed it back over Christmas. From there we went on to suffer the indignity of a bit of a mauling from Spurs but rather than stamp his feet, Jose Mourinho simply dug his heels in and since New Year’s Day we remain the only Premier League team not to lose. Unbeaten against all of our title rivals, we’ve lost just two games this season and have taken the title with a thirteen point gap (16 at the time) and games to spare. We’ve done that, not because we’ve been luckier than the challengers and certainly not because we’ve had decisions go our way. Like everyone else, we’ve had to contend with the absence of key players, we’ve had injuries and suspensions. In fact, for the past month we’ve had to do it without our first or second choice strikers – but we’ve done it. Yes, Jose Mourinho has adapted the way we’ve played – because he’s had to. Should he have continued to go for ‘entertainment’ despite specific players being unavailable to play the same way? Should he maybe have risked a few games, a few points, for aesthetics sake? 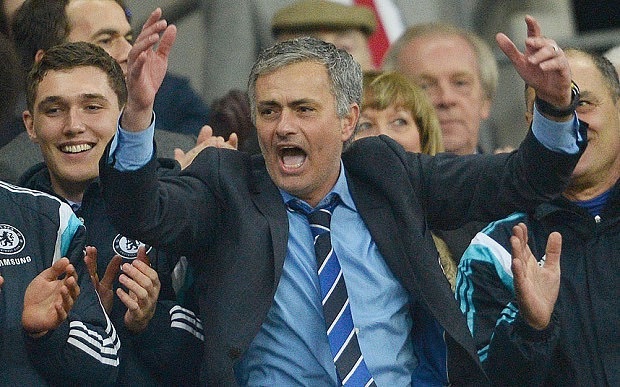 Jose Mourinho didn’t return to Chelsea FC to play one upmanship with his fellow managers. He didn’t return to play silly buggers with the press or the FA. Yesterday, despite their best efforts, Jose Mourinho did what he came back to do – and he did it his way.